A 1964 raised American variety with some enviable qualities; it is odd that 'Aurora' has not become better known. 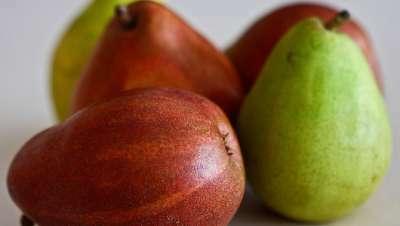 The fruit is very large, evenly and clasically Pear shaped, and a clean shiny lemon yellow with a pinkish blush on the sunny side. A most attractive variety with a good perfumed aroma, the flesh is sweet and juicy. Harvest in early October, will store in good condition for several weeks. A fertile variety, easily pollinated by Williams, Beth, Onward, Sensation, Concorde, Winter Nellis etc.